Scary reports about drones frequently pop up in the news causing many people to think of all drones as sinister military weapons. But not all drones are mercenaries. Thirty years ago, I came home to find a drone flying around in my living room. Since my husband and son were flying it, I wasn’t the least bit scared. I did, however, strongly suggest that the outdoors might be a better place to fly their remote control helicopter. My husband has built many of these remote control aircraft over the years. They are tricky to build and even trickier to fly. On more than one occasion, he would return from a flight with a sad expression on his face and drone pieces in a bucket. We were recently visiting the famous zig zag Lombard Street in San Francisco when a little darting drone appeared overhead. ”It’s taking pictures,” my husband noted. Later we saw the drone make a perfect landing on a nearby sidewalk. Not all drones are this lucky. I recently found this hilarious item in Dutch News. So if you fear drones, just get yourself a chimp. 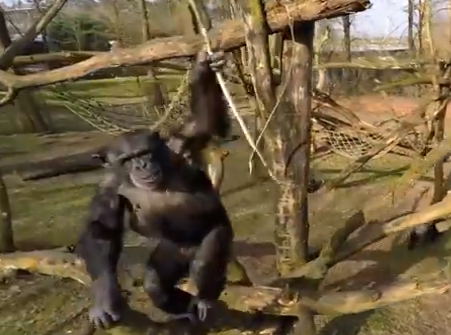 Officials at Burgers Zoo in Arnhem found out to their cost how intelligent chimps are, when one knocked a drone which was filming the apes’ enclosure out of the sky. The drone was being used to make footage for a television programme but did not go down well with one of the inhabitants. Once the drone had been spotted, the primates armed themselves with long sticks, the zoo reports on its website. One chimp, a 23-year-old female called Pushi, was sitting in a high tree when the drone came buzzing by. She managed to swipe it with the stick, causing it to fall to the ground. The chimps then proceeded to dismantle the spy plane, which kept on filming during the process, the zoo said. Zoo spokesman Bas Lukkenaar told USA TODAY Network it was no surprise that Pushi was the ‘main perpetrator’. ‘Some are good at throwing and others only produce poor shots and Pushi is a very clever and capable chimpanzee,’ he said. This chimps action is the definition of man’s primate battle with the technology that both supports us and enslaves us at the same time. Score one for two million years of ancestors who worked so hard to put that stick in his hand.